Frank was in a Marine uniform when he accepted his Trophy. He still holds the Orange Bowl total offense record-382 yards rushing and passing. He also passed for 2,331 yards during his college career. His 13 passes for 243 yards and three touchdowns, rushing for 139 yards including a 43-yard TD run, for a total 382 yards, is still regarded as the greatest in any Orange Bowl Classic. Frank played several years in professional football and coached at the University of Tampa in Florida for the 1950-51 seasons. He then entered the wholesale beer distributor business in Asheville, North Carolina, and Athens and Gainesville, Georgia, and was elected President of the Georgia Beer Wholesalers in 1977. He was a member of the University of Georgia Presidents Club, Outstanding Alumni, and a member of the Athens Country Club and Chamber of Commerce. Frank passed away on October 22, 1990. Frank was elected to the National Football Foundation and College Hall of Fame in 1954. It was a clean sweep for Georgia's Sinkwich, who was far in front in all five sections and became the first Heisman winner to lead the balloting in each section. Sinkwich made headlines the year before when he played with a special helmet and face guard to protect a broken jaw and became one of the first collegians to use a mask. Castleberry's third place finish was the highest by a freshman up to that point. Castleberry never got another chance as he was killed in action during World War II. 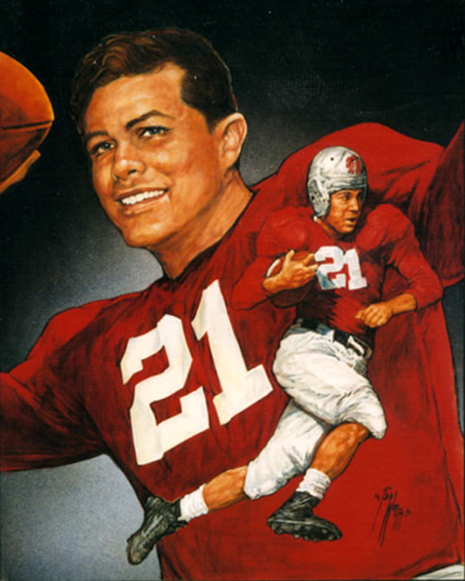 Francis "Frank" Sinkwich (October 10, 1920 – October 22, 1990) won the 1942 Heisman Trophy as a player for the University of Georgia, making him the first recipient from the Southeastern Conference. In the course of a brief but celebrated career in professional football, Sinkwich was selected for the National Football League Most Valuable Player Award. He was inducted into the College Football Hall of Fame in 1954 . Sinkwich gained early recognition as a star athlete at Youngstown's Chaney High School. He went on to the University of Georgia and played under coach Wally Butts. In 1941 he led the nation in rushing yards with 209 carries for 1,103 yards. He was a two-time All-America selection and led the Bulldogs to an 11-1 season in 1942, capturing the Southeastern Conference Championship and a victory over UCLA in the 1943 Rose Bowl. That same year, the Washington D.C. Touchdown Club honored Sinkwich as "back of the year", and he was overwhelmingly voted the Number 1 athlete for 1942 in the annual poll by the Associated Press over second-place finisher Ted Williams of the Boston Red Sox, a year in which Williams was American League Batting Champion, American League Home Run Champion and hit for baseball's triple crown. In his three-year college career, Sinkwich rushed for 2,271 yards, passed for 2,331 yards, and accounted for 60 touchdowns–30 rushing and 30 passing. He was the leading NCAA rusher in his junior season of 1941 with 1,103 yards. 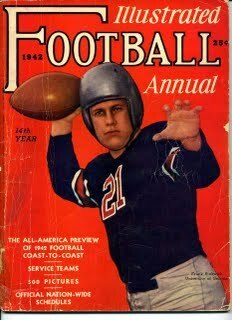 During his Senior year of 1942, Sinkwich set the NCAA single-season total offense record of 2,187 yards. Sinkwich earned his Bachelor of Science in Education (B.S.Ed.) from the University in 1943 and was a member of Pi Kappa Alpha Fraternity. Frank "Flatfoot" Sinkwich earned the first Heisman Trophy awarded to a southern college player. He brought national recognition to the University of Georgia's football program and contributed to his alma mater for the remainder of his life. 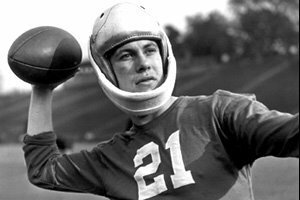 Sinkwich was born October 10, 1920, in McKees Rock, Pennsylvania. His parents, Croatian immigrants from Russian Georgia, raised him in Youngstown, Ohio. 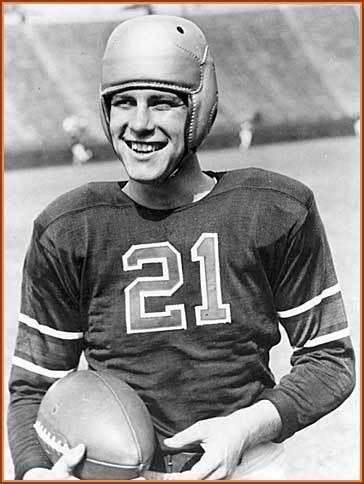 In 1941 Sinkwich earned All-American honors as the team's leading halfback. After having his jaw broken early in the season, he played the remaining regular season games with his jaw wired shut and a large jaw protector attached to his helmet (an innovation preceding the first face masks). He wore the protector when he led Georgia to a 40-26 victory over Texas Christian University at the 1942 Orange Bowl, Georgia's first postseason appearance. His performance, called one of the best individual performances in Orange Bowl history, included receiving nine of thirteen passes for 243 yards and three touchdowns, and 139 yards rushing, capped by a 43-yard touchdown run.